Stop the Big Five from becoming the Big Four. Wherever we live, young people need to actively participate in determining the future of the world's shrinking wilderness areas. Why? So that the animals, plants and beautiful earth are left for the next generations to appreciate and enjoy. My Save the Rhino journey started on my 11th birthday. My mum had been telling me about the plight of the Rhino, so I decided it was time to try and make a difference. I felt it symbolic that most of the demand for the horn originated in Asia, where I lived, but I was born in South Africa, where most of the world’s population of rhino occur. I did not want the Big Five to become the Big Four! Instead of an ordinary birthday party, I asked my friends to join me and paint Save the Rhino pictures. 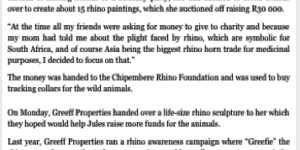 My friends painted awesome pictures of rhino, and when we had finished, we auctioned them off and managed to raise a total of R30 000. 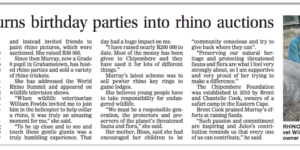 We had great fun for a great cause and my friends and their parents learned a lot about the plight of the rhino! If you'd like to find out more about us or want to get involved, please send us an email and we'll get back to you as soon as we can.